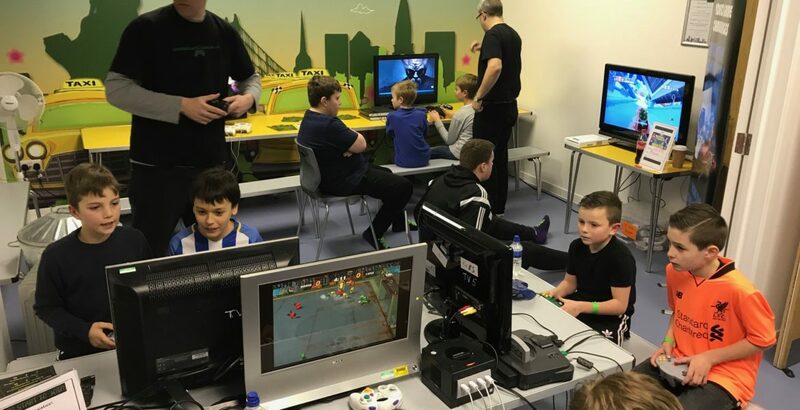 Sky High Trampoline Park in Peacehaven hosted an exclusive event on 1st March which brought together the gamers of East Sussex. Gamers enjoyed an hour in the trampoline park, freestyling and battling against in other in Slam Dunk, Aeroball, Walk the Wall and the super-sized air bag. After grabbing a drink to quench their thirst they headed to the gaming area, set up by Press Start 2 Join. There followed an hour of serious gaming challenges and contests. Bouncing in the 11,000 sq. ft. park certainly got the players galvanised to deliver their best gaming performance. Press Start 2 Join are passionate about the original gaming experience and offer some of the retro consoles alongside the more modern platforms. They have over 2000 games to choose from and has every console under the sun from the original retro Atari to modern day consoles. It was some of the gamers’ first experience on a Nintendo 64, a Playstation 1 and a Sega Dreamcast and they loved it! The characters were the original favourites and included Pac Man, Zelda, Smash Brothers and FIFA Street 2 to name just a few. Some accompanying parents couldn’t resist having a go as they reminisced about video games from years gone by! The first big game challenge of the night was the Bobsleigh run on Mario and Sonic at the Olympics, the competition was great fun and really competitive for all ages. The modern day contest was a Tekken 7 tournament on the PlayStation 4. Eight contenders took on the challenge and raised the roof all the way to the final, with one local gamer taking away the coveted Press Start 2 Join trophy. The atmosphere in the park was one of excitement and enjoyment and the passion on gamers’ facers was incredible as they took on the challenges. Bouncing and gaming with friends is a truly social experience which sends your activity levels sky high, gets the heart pumping and allows you to socialise with like-minded friends, both new and old. The event was a huge success and is taking place again on Thuursday April 12th. You can book tickets at www.skyhightrampolinepark.co.uk or on 01273 580029.